Another James Martin: Home Comforts-related post, this time about carrot jam, the recipe for which I have had several requests. I first cooked carrot jam for a laugh. A friend emailed me the recipe for it as published in an 1858 copy of the English Domestic Woman’s Magazine. The EDWM was one of Samuel Beeton’s titles, and Isabella Beeton, of The Book of Household Management fame, cut her culinary writing teeth within its pages. She compiled a column called ‘Cookery, Pickling and Preserving’, out of which would eventually come the idea of the Book of Household Management. It’s still the best known historic recipe book in Britain, and had never been out of print, despite its many, many flaws. One thing is does have going for it is that it does tend to have a recipe for everything, including carrot jam. Beeton’s version, which will either have been plagiarised, as per most of ‘her’ recipes or, possibly, given it appeared first in the EDWM, sent in by a reader, is a rare thing when it comes to her recipes – it’s brilliant. Plus, the instructions are spot on. She tells you straight that it won’t last without brandy: it doesn’t. Blue mould, folks! Here’s her recipe. This is classic mock cookery, and it works, If you don’t tell people it’s carrot jam, they will ponder, purse their lips, and eventually guess at apricot, mainly because it looks orange (and the almonds and brandy are confusing). It’s also indicative of a strong tradition of lower class cookery which isn’t always talked about as much as middle and upper class cuisine now. We tend to rely on books as sources for recipes. Cookery books are usually aspirational and/or didactic, and they rarely reflect the everyday – just think about whether any one, or indeed, several, cookery books on your own shelves, taken out of context and without you saying things like ‘I’ve never cooked that’, or ‘I don’t use that recipe because I’ve got one in my head that’s better’, would give an accurate view of what you eat over the course of a week. Plus, the stuff that’s fancy is more interesting for people to watch on TV. Carrot jam is a very practical recipe. No need for expensive fruit – sugar is pretty cheap by the end of the 19th century – and carrots glut and don’t keep that well. And it’s tasty, so everyone’s a winner. The recipe knocks about for a while, but disappears from the 1930s editions of Beeton and, we can only presume, the wider culinary repertoire (if it was ever part of most people’s repertoire, which is impossible to tell. The fact a recipe is in a book is no guarantee it was ever cooked). Then comes the Second World War and, with it, rationing, the Dig for Victory campaign and a massive carrot glut. Cue carrot madness. The Ministry of Food wanted people to eat the glut, so promoted carrot recipes through the various channels at their command – The Kitchen Front on the BBC, the official pamphlets, and by spreading the rumour that carrots help you see in the dark. They encouraged the idea that that was how Allied bomber pilots were so accurate in night flying, which also helped muddy the waters of exactly how far advanced experiments with radar were. Meanwhile, to help with gluts of fruit, extra sugar rations were available for jam making…the stage was set for a carrot jam comeback! 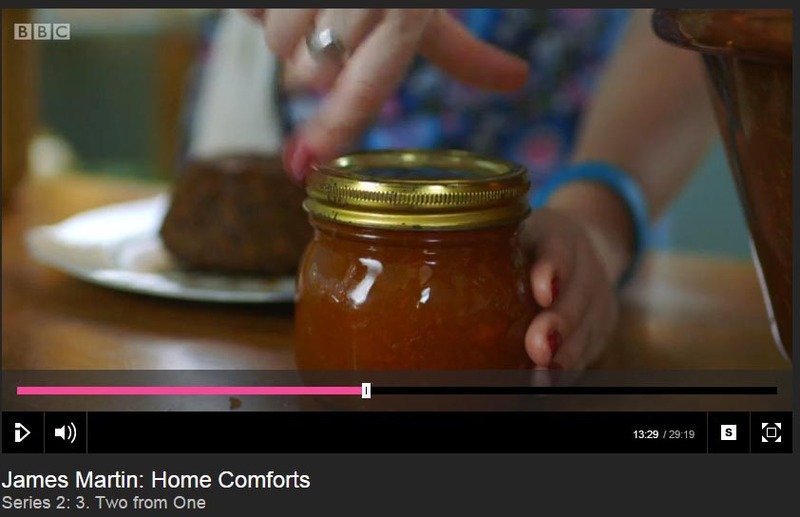 Whenever I cook carrot jam, I’m greeted with nostalgia and cries of ‘that’s a wartime recipe’. And so it is – but the wartime version was a adaptation of a somewhat earlier recipe. (The same is true of many rationing recipes – poverty cooking has always made use of grown or foraged ingredients, and ever lacked fat, sugar and meat). The wartime version omitted the brandy and the almonds, and just contained sugar and carrots. There’s slightly less sugar to carrot pulp, and the lemon flavour was provided by lemon essence, or boiling apple peel in a bag. The version I made for James Martin: Home Comforts, was the wartime one, which can be found here, on the website of the endlessly fascinating World Carrot Museum. If you really want to make it at home though, I’d recommend the Beeton one above, substituting a few drops of almond essence (check the label and try and get bitter almond essence) for the bitter almonds, (which can be challenging to obtain due to the bit where they contain cyanide). I’d also suggest using jam sugar (the stuff with added pectin), so that you get a decent set – it’s quite sloppy otherwise – and taking the whole lot a couple of degrees above the standard set point of 104.5c. I never bother with the wrinkle test – a decent digital thermometer is every cook’s friend. Have fun. Jam pan in action. TKMaxx sometimes has them, if you really really want one of your own. Here is the full clip, which is now up permanently on the James Martin: Home Comforts website, thanks to the lovely BBC listening to all your comments about wanting the recipes and deciding it would be a good idea. Stuffed Lettuces and Kedgeree are also up. Blackberry season is upon us. I can’t help it: I’m mad for them. Every half-hearted jog from late August to the end of September sees me coming back with purple-stained fingers and scratches up my arms. This year, banned from jogging due to injuring my knee, and with the hedgerow that keeps on giving at the end of the road denuded by the other sods who live in my street, I’ve (re)discovered cycling as a ‘way to keep fit’. It goes like this: put large container in bike panniers; cycle off looking serious (in cycling shorts and hi-vis vest); do at least 10mn of proper cardio style work; find blackberry patch….on Friday I managed 25 whole minutes of actual exercise and an hour of blackberry picking. Calories burnt: some; miles covered: 5ish; all pitiful, but when measured on the blackberry scale…4 litres. Not bad. I was picking thorns out of my fingers for two days afterwards, and my fingernails are still black, but overall, I’d say that was a good morning’s work. Trouble is, I pick all of these things, and then I have to do something with them. Put together with the blackberries I’d scrumped previously in the week, I had nearly 6lb of gooey black loveliness. Last year I did endless tarts. This year I was up for jam…except I don’t really like jam. Neither I, nor M eat much of it. 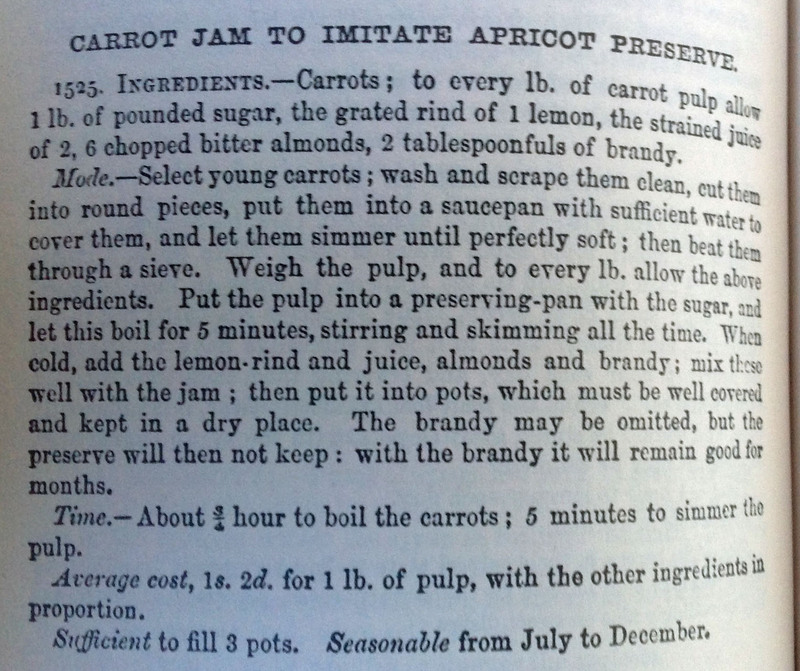 I have buckets of carrot jam which I use for Victorian and Second World War events (Mrs Beeton published a recipe for it in the English Domesticwoman’s Magazine in 1858 and, unusually for her, didn’t garble it much and it actually works). I also have a few bits and bobs which I tend to use for making sorbet. But jam, as a rule, comes under the heading of ‘why did I make that again?’ Sod it, thought I, I can always use it for something, or give it away. But, in the spirit of common sense, I also found a recipe for blackberry and apple gin (thank you, River Cottage). The jam proved more challenging, as all the historic jam recipes I read were for very basic jam, which didn’t suit my mood at the time. Most of the blackberry recipes in my collection tended more towards ‘shape’, along with fool, pies and a lot of wine. 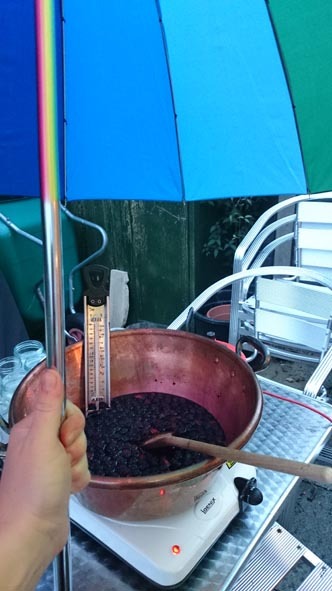 Indeed, so ubiquitous was the use of blackberries for wine, I set aside 3 pints to have a crack at an 18th century version (Elizabeth Raffald, 1769, and of which, more anon). Eventually modernity won out, in the form of Diana Henry’s blackberry and Pinot Noir jam. All of which leads me to the adventure. I have been banned from making jam in the kitchen. In the house in general, in fact, though the garage remains a grey area. I have form. The Great Quince Cheese Incident of 2013 is writ large in the annals of shame round here, involving, as it did, quince dripping from the ceiling like congealed orange bogeys, and orange jammy stains all over the walls. We had to redecorate. It was not nice. We had moved in a mere 2 months earlier… In fact, I have worse form than that, since only 2 weeks are moving in with M I was steaming Xmas puddings and accidentally let one boil dry. Cue lots of smoke, me running outside with the saucepan, net curtain billowing in the breeze then billowing onto the hot pan….scorched nylon pattern by now on the outside of huge pan, massive panic… Etc etc. I did learn a lot about what boiling a pan dry does to the bottom of a putting basin though, which comes under the heading of experimental archaeology. It helps explain the pattern of cracks on several of the ceramic food moulds in the collection of York Castle Museum, so not all was bad. Oh, and then there was the Flaming Microwave Incident, which also resulted in me melting the wheel of the BBQ as I threw the baked potato which was the cause of the flames out into the garden, where it hit said wheel and caused said melting. Oops. I had to buy a new microwave and mildly redecorate behind it. Liability, much? I have, therefore, had to expand the jam making arm of my culinary operations into the garden. Banned from the kitchen? A plug in hob, an extension cable, pan and convenient table are the answer. Until…it starts to rain. I’m not going to continue. Suffice to say, I was eventually allowed back into the house on pain of extreme death if one splatter made its way onto the walls. The jam was superb. And I have discovered that I can now guess set point accurately once the thermometer gets to that annoying one-degree-below-where-it-needs-to-be bubbling point without recourse to saucers or the wrinkle test. It’s at perfect set point just before it explodes onto the ceiling. If only I’d known that last year. My tomatoes have blight. Two weeks ago, it was merely the odd brown leaf, and I looked proudly at them and considered them rustic and French potager-like. But in the last few days I have had to face facts: they are blighted, benighted and frankly buggered. Happily, I am not the only sufferer. It’s the first year I’ve grown them in the ground, since up to last August my garden was roughly the size of the average sofa, and everything was in pots and growbags. I feared it was a novice gardener thing, but apparently our passive aggressive allotment-owning neighbour has lost all of his tomatoes too, so all is well with the world. I’ve ripped out the vines, lamented over the vast, squishy, brown ex-crop and, in a spirit of blight defiance, stripped off all the green tomatoes which remain unaffected. I really hate waste. I had vaguely planned a green tomato chutney, but it seemed far too obvious. Plus, I have only just finished the divine, but incredibly rich 1870s chutney from three years ago, and I have three jars of various homemade chutneys people have given me. All lovely, I’m sure, but how much chutney does a girl need? Obligatory with a cayenne-laden Victorian kedgeree, good with a meat chop or a cold pie, but after that… Mouldy chutney beckons once again. So, given a recent mild obsession with a particular type of Scandinavian pickle, it seemed obvious that pickled tomatoes was the way to go. Pickled veg seems peculiarly un-British in 2014. Branston, yes, pickled things, yes (onions, eggs, gherkins, beetroot – bring it on), but beyond that, the habitual use of pickled veg (and fruit) seems a bit Scandinavian, or maybe Japanese. Fermenting, salting, brining, pickling, all techniques which we’re turning it enthusiastically, if the food press is to be believed, but when it comes to using the results, are a little but harder to place. 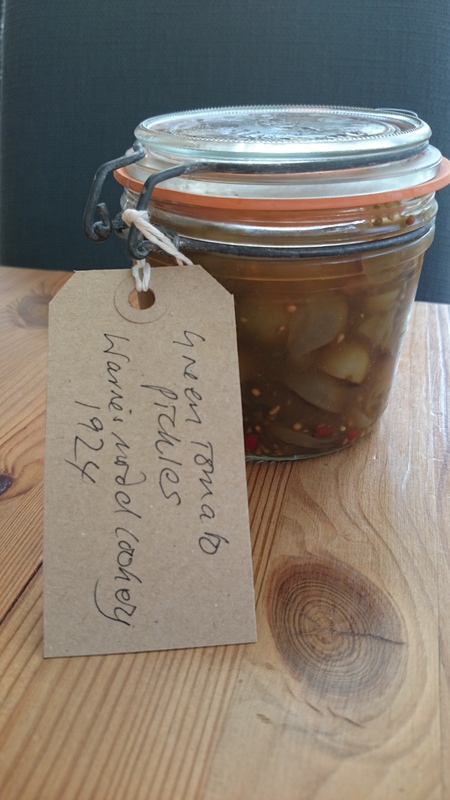 I’ve gone back to the 18th century, when pickling the various gluts from the garden (and hedgerow) was a normal part of the culinary year, and I’ve started using pickled bits of stuff as a general accompaniment to pretty much everything. A typical lunch at the moment would be a poached egg, some beans or rye bread, chopped parsley and oodles of pickles. For the tomatoes, I dug out a recipe from 1924, from Warne’s Model Cookery. No point in looking much further back than the mid 19th century, for tomatoes weren’t widely grown until the Victorian period, and early recipes tend to revolve around ‘tomata sauce’, or catsup. 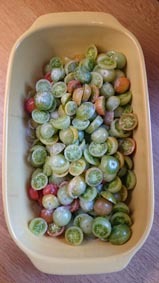 All you do is slice and salt, then cook the tomatoes up with pickling vinegar, sugar, garlic, chilli, mustard and cloves. They retain a certain amount of texture, and they take on flavour from the spices. The tartness of the green tomatoes cuts through the sugar, and the spices pack a fairly hefty punch, compared to some of the anaemic shop-bought pickles around today. They are much better than a chutney would have been, and I confidently predict that they won’t be around for long. I’d have loved to keep my lovely tomato plants cropping and bursting with health, but it was not to be. I feel this is a suitable elegy to the heap of sorry brown badness now in the council’s green bin. RIP, tomato plants.